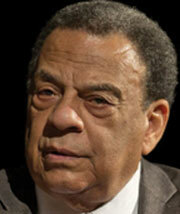 FORT LAUDERDALE, FL — The YMCA of Broward County will welcome nationally acclaimed Ambassador Andrew Young on Friday, Jan. 17, 2014, to commemorate the local work and legacy of Dr. Martin Luther King, Jr. for the 10th annual breakfast at the First Baptist Church, 301 S. Broward Blvd. in Fort Lauderdale. Young will share his insights on how he confronted segregation with Dr. King and galvanized a movement that transformed a nation through non-violence. Young was a key strategist and negotiator during the Civil Rights Campaigns in Birmingham and Selma that resulted in the passage of the Civil Rights Act of 1964 and the Voting Rights Act of 1965. Thanks to JM Family Enterprises, Inc., the Y will bring more than 500 community and business leaders together to promote the YMCA cause of fostering unity and equality in people of all faiths and backgrounds. The YMCA of Broward County has been hosting the annual MLK breakfast consistently for a decade in order to pay tribute to a man who was, and will continue to be, a symbol of what the Y stands for.